When John and I moved into our loft - I made it a point to claim a small corner as my own. Oddly enough, it ended up being the LAST place I worked on. Whether it was the time of the year (we set up our Christmas tree in that corner) or a lack of ideas - this corner remained empty-ish. To keep with my "multi-purpose" theme, found throughout the rest of the loft, we wanted to keep the amount of furniture to a minimum. After saying "no" to several single chairs, I ended up purchasing this butterfly chair frame and the Kilim pattern chair cover both on sale at Urban Outfitters. I am completely obsessed with sheepskin - it adds just bit if softness and layers beautifully. You can find it on various pieces throughout our loft. In place of a side table, we scooped up two cube poufs - one for this corner and another used as an optional ottoman in our living room. To help define this corner, I knew I needed a rug that would separate the space but still felt inviting and open. For this I opted for a large circle rug. 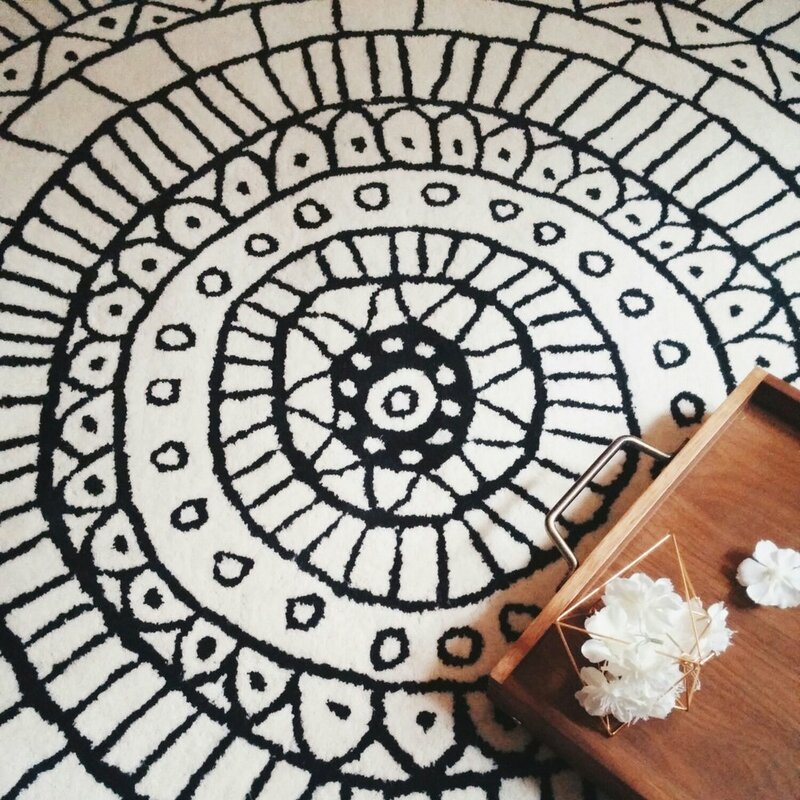 I absolutely fell in love with this rug at first sight - symmetry and chaos all in one very pretty and very comfy package. At this point - I had decided to transform this area into a self-proclaimed pillow land. I often find myself sprawled on the floor, in this corner, gathering the toss pillows from our living room and the decorative pillows from our bed for support. So I thought, why not make it official. After surveying some of my favorite shopping spots, the pillow-collecting...or rather obsessing...began. I sought after pillows that were both eye-catching but also comfortable. A variety of patterns and textures were a must!